In the final results compiled together with elections on the November 16th and November 30th, Mr. Willie Obiano polled a total of 108,178 votes to PDP's Tony Nwoye who came second with 97,200 votes. APC's Senator Chris Ngige came third with 95,963 votes and Labour Party's Ifeanyi Ubah came fourth with 37,495 votes. I sensed it that Obiano was going to win, many Anambra people liked Ngige to be Governor, but what a sentiment that he's on a wrong party (APC) in Igboland. Why? Do you think same outcome might follow in Imo State come 2015 where the sitting Governor is now in All Progressive Congress (APC) political party? Congratulations to Mr. Willie Obiano! 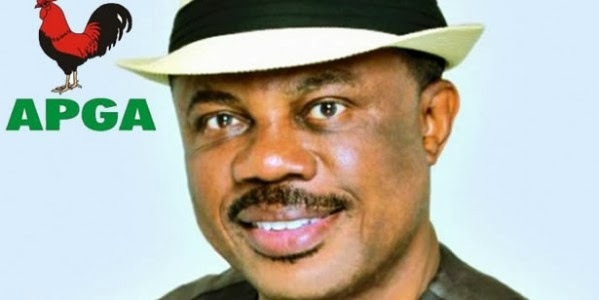 The Executive Governor Elect of Anambra State, Nigeria.